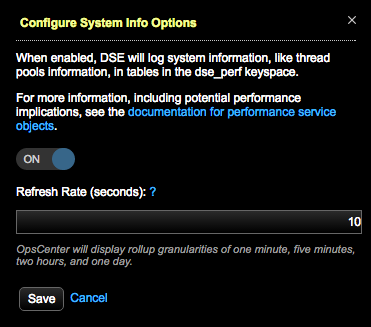 Configure logging system information such as thread pool statistics in the dse_perf keyspace. The only option to configure is the refresh rate for updating the system information tables. Click the Configure link for Thread Pool Stats. The Configure System Info Options dialog appears. Enter a Refresh Rate at which DataStax Enterprise updates the system information tables. Setting the refresh rate to 60 seconds or greater is recommended to match the minimum default frequency at which OpsCenter collects and aggregates metrics data.